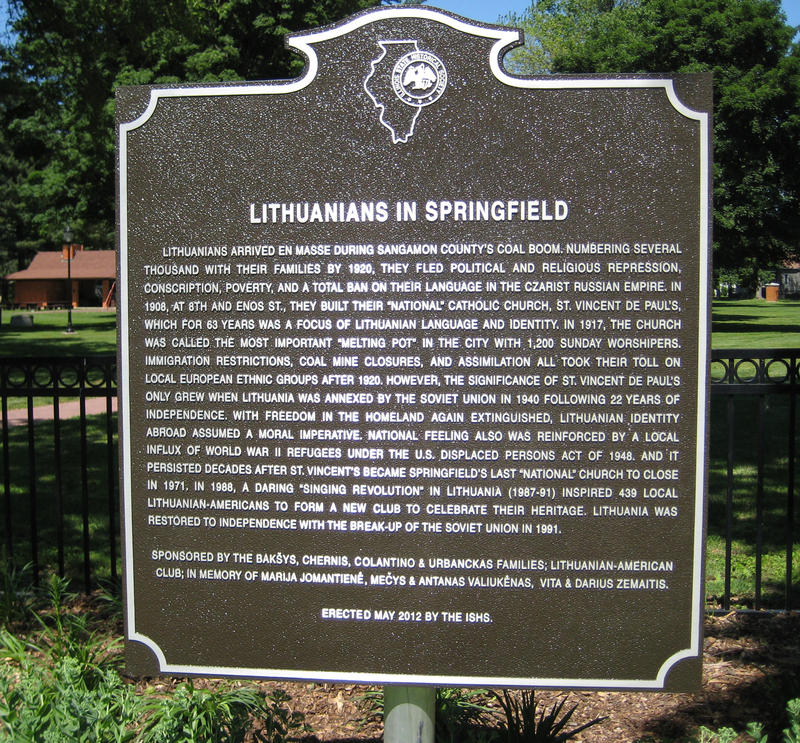 LITHUANIANS ARRIVED EN MASSE DURING SANGAMON COUNTY’S COAL BOOM. NUMBERING SEVERAL THOUSAND WITH THEIR FAMILIIES BY 1920, THEY FLED POLITICAL AND RELIGIOUS REPRESSION, CONSCRIPTION, POVERTY, AND A TOTAL BAN ON THEIR LANGUAGE IN THE CZARIST RUSSIAN EMPIRE. IN 1908, AT 8TH AND ENOS ST., THEY BUILT THEIR “NATIONAL” CATHOLIC CHURCH, ST. VINCENT DE PAUL’S, WHICH FOR 63 YEARS WAS A FOCUS OF LITHUANIAN LANGUAGE AND IDENTITY. IN 1917, THE CHURCH WAS CALLED THE MOST IMPORTANT “MELTING POT” IN THE CITY WITH 1,200 SUNDAY WORSHIPERS. IMMIGRATION RESTRICTIONS, COAL MINE CLOSURES, AND ASSIMILATION TOOK THEIR TOLL ON LOCAL EUROPEAN ETHNIC GROUPS AFTER 1920. HOWEVER, THE SIGNIFICANCE OF ST. VINCENT DE PAUL’S ONLY GREW WHEN LITHUANIA WAS ANNEXED BY THE SOVIET UNION IN 1940 FOLLOWING 22 YEARS OF INDEPENDENCE. WITH FREEDOM IN THE HOMELAND AGAIN EXTINGUISHED, LITHUANIAN IDENTITY ABROAD ASSUMED A MORAL IMPERATIVE. NATIONAL FEELING ALSO WAS REINFORCED BY A LOCAL INFLUX OF WORLD WAR II REFUGEES UNDER THE U.S. DISPLACED PERSONS ACT OF 1948. AND, IT PERSISTED DECADES AFTER ST. VINCENT’S BECAME SPRINGFIELD’S LAST “NATIONAL” CHURCH TO CLOSE IN 1971. IN 1988, A DARING “SINGING REVOLUTION” IN LITHUANIA (1987-91) INSPIRED 439 LOCAL LITHUANIAN-AMERICANS TO FORM A NEW CLUB TO CELEBRATE THEIR HERITAGE. LITHUANIA WAS RESTORED TO INDEPENDENCE WITH THE BREAK-UP OF THE SOVIET UNION IN 1991. SPONSORED BY THE BAKŠYS, CHERNIS, COLANTINO & URBANCKAS FAMILIES; LITHUANIAN-AMERICAN CLUB; IN MEMORY OF MARIJA JOMANTIENE, MECYS & ANTANAS VALIUKENAS, VITA & DARIUS ZEMAITIS. ERECTED MAY 2012 BY THE ISHS. 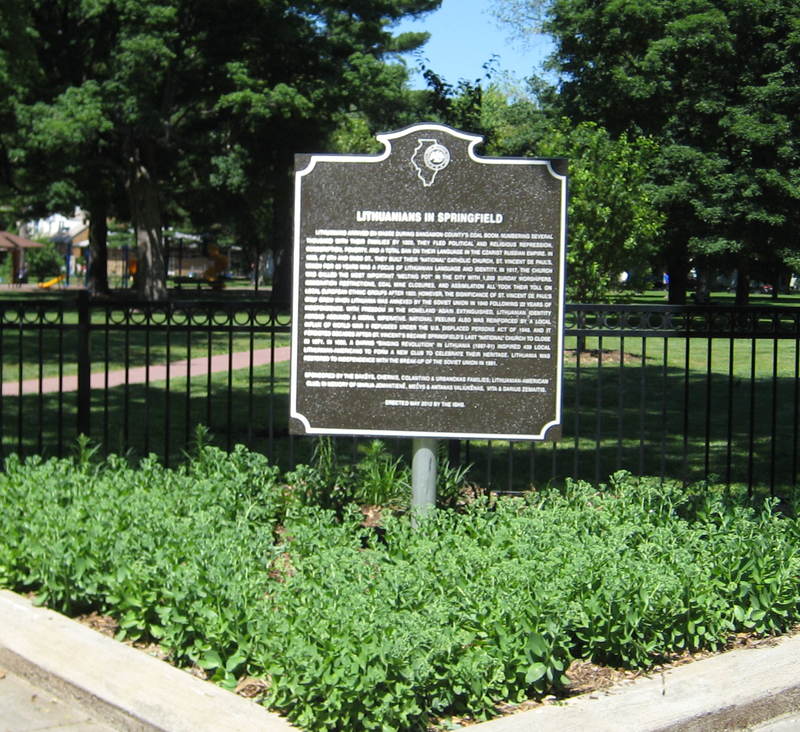 The marker stands at the southwest corner of Enos Park, Seventh and Enterprise Streets, in Springfield, Illinois.